I lived just a short bike-ride away from my Nana and Papa’s house, so I spent many afternoons seated at their kitchen table with a bowl of Jell-O as they sipped coffee and told me about their childhoods. I was fascinated by their stories of being raised by Irish immigrants in the tenements of Holyoke, Massachusetts, in the 1910s and ‘20s. Running away from home to join the circus, taking the trolley up Mt. Tom to go to dances, and going to the corner store to hear the latest baseball scores were just a few of my favorites. As I sat down to begin my genealogical research, I couldn’t help but wonder: how could I find anything I didn’t already know, when I already had such wonderful, personal insights into their lives? 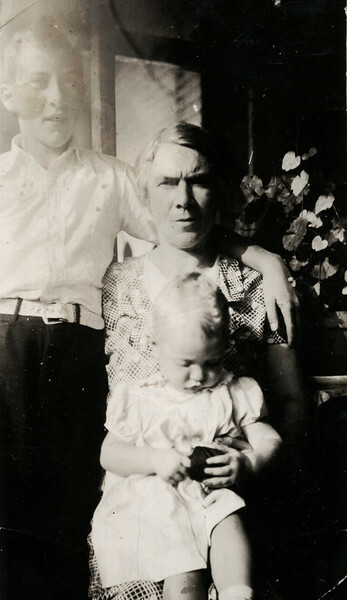 Julia Deane with her son Lawrence and niece Nora Noone. Of course, I quickly realized how wrong I was. While searching for my Nana’s family, I found her 1914 birth record, as well as the birth records for all of her siblings. There were the familiar names: Francis, Mary (my Nana), Rose, Edward, Nora, and Lawrence. But then I noticed something strange – two additional birth records for twin baby girls, born to my great-grandparents in 1910, two years before any of the children I knew about. Shocked, I quickly searched for their names in the death records. The first twin had died just after she was born, and the second had followed just a month and a half later. While I was, of course, saddened to learn that my great-grandparents had lost these children, there was something that intrigued me further – the names of the twins were Mary and Nora, the same names that my great-grandparents would give to my Nana and her sister just a few years later. I shared this discovery with my family and they felt just as curious about it as I was – how could my great-grandparents recycle the names of these twins as if they had never existed? To my surprise, while researching my Papa’s family I made an identical discovery. There was his 1913 birth record, along with those of all of his siblings. But there was also a baby I had never heard of before, Daniel Griffin. Daniel was born on 2 July 1912 and died just two months later. His name would later be given to another child in the family, just as my Nana’s parents had done with the names of their twin girls. Realizing that this could not be a coincidence, I visited a few Irish genealogy websites and discovered that naming children after babies who had died previously is an Irish custom, meant to honor children who have died and insure that they aren’t forgotten. Though I had never known that my grandparents had had these siblings who died, I realized that in many ways this custom had served its purpose. By following this Irish naming tradition, my great-grandparents had set in motion a way of honoring their lost children that would echo through three generations. Because of their decision, I now have an aunt and two cousins named Mary, a sister named Nora, and a brother named Daniel. 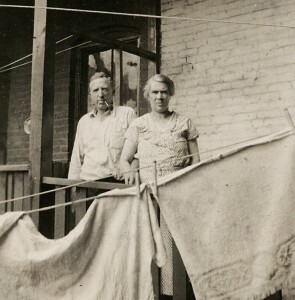 Though I am still only filling out the lowermost branches of my family tree, I am learning that genealogy isn’t just about connecting names and dates back through the centuries until you can go no further. Genealogy can also provide a window into cultures, traditions, and the other facets of family life that shape who we are and history as a whole. As I continue my genealogical research, I can’t help but wonder if these names have an even deeper tradition in my family. Will I find Marys, Noras, and Daniels as I delve further into the past? I’m looking forward to finding out. Thank you for a very informative article…would you know if there is a similar Scottish tradition? My grandfather was one of 13 children born to a Scottish family whose ancestors came from the Isle of Skye arriving on Prince Edward Island in 1803. There were at least 2 children who died very early whose names were given to subsequent children. Maybe this is a Gaelic tradition. Naming children for deceased siblings was not only an Irish custom — it was also widely and commonly practiced in non-Irish New England families as well. Great post. It is always a bit daunting keeping all those “born of the same name” straight when some of the even older birth records are sketchy at best – especially after the passing of a sibling. It always makes me wonder – now which one was this? – My grandmother was Julia Ann. Her twin sister was Sarah Jane. They had daughters, respectively, named Sarah and Julia – and while these children didn’t pass on – their own daughters named their sons Thomas after their grandfather – Yikes! This was indeed a widespread practice, not only among the Irish and not only long ago. We were amazed to discover that my own husband had a baby brother born a year before my husband and given the identical name, first, middle and last. That baby died within hours of his birth due to an accident during childbirth. None of us knew until we young women started having children and my mother-in-law was terrified the same thing would happen. She then told us the story. My husband’s family is very old New England, back to the 1600s, in Boston and Portsmouth NH. So not Irish. I am of Irish descent and have found the same pattern in my family’s background. Often the name of the deceased was given as a middle name. My great-grandmother, Fenji, was the third daughter given that name. Both of her older sisters named Fenji lived about a year. Often the choice of a name was to honor an ancestor – for good or inheritance reasons. Rather than miss out, the next child was given the same name. Another peculiar naming tradition is that of naming a second wife’s first daughter after the first wife. I don’t think I’d appreciate having to do that, but it happened several times in our family. My husband’s grandfather wanted a son to bear his name. Two sons with his name(over two marriages) were born and died before my father-in-law survived as Junior. This is excellent. So well written! I love the personal connection – it’s so genuinely interesting! I have found the names were used again many times in the 1600-1700 in New England, in my “Torrey” line starting with Captain William Torrey 1608-1690 who named his son William, and it filtered through the family line. I have chosen to add a number to their names to help me keep it straight. I have a total of 7 William Torrey’s. My great-grandfather and his first wife had two sons with the same name. Both were named after his wife’s father. The first died at age three, and the second was born a year after the first son died. The oldest son was named after my great-grandfather’s father. These are pretty typical naming patterns. Both families were from England in the early 1700s or before. I find this tradition also among my German families and other cultures as well. I do not think there is a child in the 8 or so generations I have traced who was not named after a relative, ancestor, or, occasionally, an earlier sib who died. The names cross not only generations, but propagate across collatoral lines. I often label names, not only with birth date but with “child of….” to kep track! We bear these names proudly as a statement of belonging. And, oh my yes, there are stories attached to every one, at least the recent generations. Part of the enjoyment of genealogy for me is finding the older stories for earlier generatons. I include them for what they are: not always verifiable, but nonetheless a reflection of how they defined themselves and each other. I have seen this often in the Swedish Church Records while researching my maternal line. My 3rd great-grandfather was the third of his name. And then there are the ONLYS. Even as a genealogical novice, I could “see” the gap in the birth records of my grandfather and his siblings, children of Irish parents (Co. Mayo & Co. Cork who m. in CT). Two children as expected — then a space — then the next child as expected. I asked my father and his sisters (all born after 1900) but they knew nothing. Also, nothing in Bridgeport city records, so the child was born wherever my great-grandfather was then working as a laborer and not recorded in local records which eventually were index-carded at the CT State Library (though perhaps I should look there again). When I finally concentrated on my father’s side again, I went to the Diocesan records at St. Augustine’s in that city. There among the baptismal records of his siblings (up to when they moved to another parish), was the one for George (1876). No burial record from St. A, alas. Among the child’s sponsors was ANOTHER “George Garrity”. Finding the mystery child thus created another mystery as the adult George appears in NO CT or US records that I’ve searched and was NEVER mentioned in family stories after say the 1890s. (I was way too young to even have a chance to ask my surviving great-aunts and these were not people who saved ephemera.) As more and more issues of CT newspapers come online, perhaps something will pop up. Clearly, though, what I “know” of what they just took for granted, re who’s who in the family, is really limited. There have been no other Georges among the descendants of my great-grandfather. Then, too, I am the Only Robert! My maternal grandparents were also GRIFFINs who lived on Elm Street in Holyoke from about 1920 to 1970. My maternal grandfather was John GRIFFIN, born in 1888 in County Kerry. His father was Thomas GRIFFIN, born in 1853 in County Kerry, died about 1940 in Holyoke; married to Mary REARDON/RIORDAN, born in 1860 in County Kerry, died in 1944 in Holyoke. My maternal grandmother was Elizabeth SULLIVAN, born in 1891 in County Kerry. My uncle was Thomas Griffin, a basketball coach at Holyoke Catholic and was also a town alderman. Any of these names sound familiar to you (but I think there were quite a few GRIFFINs in Holyoke) ??? Just read your comment. I have 2 Griffin families from Kerry who emigrated during the famine years. At least one had relatives in Holyoke. You may contact me at Conlet@icloud.com if you wish. Great post, my father’s family in Woodstock, Connecticut, used the name Sarah Elizabeth Child over several generations for daughters that died young. I have encountered this situation so many times in my research that years ago I took to using a Roman numeral two (II) as a suffix for the second child of the same name in a family to assist in delineating between them. So as not to add further confusion, I have also always used Jr. as a suffix for sons of the exact same name as their father. I’ve yet to encounter a third repeated name for a child as others have commented, but I expect if I ever do, it will throw my whole system out of whack, as I do currently use III, IV and even V for longer lines of linear multi-generational repeated names. Perhaps I should change to an ordinal suffix instead (1st, 2nd, 3rd), but I don’t much fancy the prospect of going back through the more than 29,000 individuals in my tree to make the changes, and I’m kind of a stickler for consistency. Another challenging situation I’ve encountered is four brothers, all of whom named their next son after their father following his death, giving me four different individuals with the same name and all born within 2 years living in the same area!!! That one has given me a ton of headaches in terms of researching records and correctly attributing them!! !